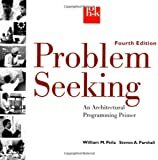 Problem seeking : an architectural programming primer / William M. Pena, Steven A. Parshall. By: Pena, William Merriweather, 1919- . Contributor(s): Parshall, Steven Anthony, 1951- .